Baton Rouge, LA – September 1, 2015 – Lamar Advertising Company (Nasdaq: LAMR), a leading owner and operator of outdoor advertising and logo sign displays, announces that its board of directors has declared a quarterly cash dividend of $0.69 per share payable on September 30, 2015 to stockholders of record of Lamar’s Class A common stock and Class B common stock on September 16, 2015. Lamar expects aggregate quarterly distributions to stockholders in 2015 will total $2.75 per common share, including the September 30, 2015 dividend and the aggregate of $1.37 of dividends previously paid on March 31, 2015 and June 30, 2015. This press release contains “forward-looking statements” concerning Lamar Advertising Company’s goals, beliefs, expectations, strategies, objectives, plans, future operating results and underlying assumptions and other statements that are not necessarily based on historical facts. These statements relate to anticipated 2015 distributions. Actual results may differ materially from those indicated in our forward-looking statements as a result of various factors, including those factors set forth in Item 1A of our Annual Report on Form 10-K for the year ended December 31, 2014, as supplemented by any risk factors contained in our Quarterly Reports on Form 10-Q. We undertake no obligation to update the information contained in this press release to reflect subsequently occurring events or circumstances. Founded in 1902, Lamar Advertising Company is one of the largest outdoor advertising companies in North America, with more than 315,000 displays across the United States, Canada and Puerto Rico. Lamar offers advertisers a variety of billboard, interstate logo and transit advertising formats, helping both local businesses and national brands reach broad audiences every day. In addition to its more traditional out-of-home inventory, Lamar is proud to offer its customers the largest network of digital billboards in the United States with over 2,000 displays. Against the backdrop of problems experienced by TV, print, radio, and online advertising, Out-of-Home (OOH) is emerging as a highly effective, accountable, and affordable mass medium of the future. 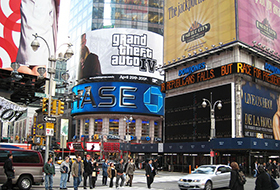 In this article, the Editor-in-Chief of Digital Signage Plus summarizes the explosion of market data testifying to the growth of OOH advertising in the past few years. 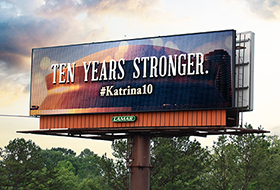 Lamar Advertising Company, one of the largest outdoor advertising companies in North America, today announced that it is dedicating space on its digital billboards nationwide to mark the 10th Anniversary of Hurricane Katrina. Lamar’s billboards will feature iconic photos of New Orleans and the message “10 Years Stronger” to remember those lost in the hurricane and to honor the individuals who came together to rebuild the city of New Orleans.